A week or two ago, a new documentary called “The Great Global Warming Swindle” was brought to my attention on a friend’s blog. While I haven’t seen the documentary, an article written about the documentary by Thomas Sowell contains enough inaccurate statements to make me question the validity of the documentary it references. I have taken a number of meteorology classes. Much of meteorology focuses on radiation, which also happens to be the root of the entire global warming issue. (Global warming is just the earth and it’s atmosphere absorbing more radiative energy than it emits.) I’ve picked out a few choice quotes from the article, and debunk them below. This statement is simply incorrect. While it is true that the globe’s temperature varies over the course of thousands of years as a result of Milankovitch cycles and other causes, there has not been any time in the past 650,000 years when the global average temperature has been higher than it is today. What the author is most likely referring to is the Medieval Warm Period (800-1300 AD). During this time, the average temperature was higher than normal in the European region and perhaps part of northern Asia. However, when you compare the average global temperature of both the Medieval times and current day, the average temperature today is much higher than it was back in Medieval times. According to the IPCC report released earlier this year (page 4), human activities have a higher effect on global climate than natural sources. Furthermore, natural sources such as volcanoes and clouds actually cool the earth rather than warm it. Clouds both cool and warm the atmosphere. Low clouds like a thunderstorm or thick layer of uniform stratus clouds cool the earth quite a bit, and reflect radiation from the sun back into space. High clouds, like the thin haze-like cirrus will trap some of the radiation the earth is emitting and warm the atmosphere slightly. The prevalence of low and mid level clouds wins out here with a cooling effect. As for volcanoes, eruptions do release ash and greenhouse gasses up into the stratosphere and this has been measurable after relatively recent eruptions like Mount St. Helens. Since volcanic eruptions are relatively rare, their contribution to global climate is minimal to the extent that I’m not sure why the article or the documentary even brought up the issue. Usually, the ash dominates by blocking solar radiation for a net cooling effect, and after an eruption locations nearby would notice solar dimming. While the effects of clouds and volcanoes combined will cool the earth’s climate significantly, CO2 and methane from anthropogenic sources have an even larger warming effect. Furthermore, the article brings up these two sources as if they are causing global warming instead of humans, when in fact they are acting as a negative feedback to the damage humans are causing. I’m not sure what “hard evidence” the author is referring to, but there are several climate models developed at various universities and scientific institutions worldwide. Most of these models are tested from 1960 on forward, because we have solid temperature measurements worldwide during this time period. All of the best models match the warming that actually occurred during this time frame, and this reinforces the validity of these models. Again, I refer to the IPCC report (page 11) that shows output from up to 14 different climate models matching temperatures over the past 100 years only when they include anthropogenic forcing as opposed to just including natural climate forcing. Hmm…I’ve actually read several news articles reporting the contrary: the government often censors scientific reports written that support the global warming problem. Actually, these grants can be used as leverage by the government to silence scientists. Release your findings, we pull your funding. Most researchers choose a topic they are interested in exploring, rather than focus on topics that have grant money available. Grant money is available through the NSF for a multitude of scientific topics. Furthermore, this assumption of researchers “going after all the money” for selfish reasons is only valid if the researchers themselves got to keep most of the money. This is far from the case, and oftentimes researchers will only receive money directly from the grant if they buy their salary out from teaching classes at a university. Researchers still don’t get any increase in salary, they just won’t have to teach as many courses. While there is nothing I can say to completely disprove this statement, I can say that global CO2 emissions from businesses in the U.S. increase every year… If big corporations were jumping on the global warming bandwagon, wouldn’t emissions decrease? Furthermore, why is global warming a political issue? It’s known that the earth is getting warmer, and it is also known that if there are lower CO2 concentrations in the atmosphere, the earth wouldn’t be as warm (this has been scientifically proven, by simply looking at the chemical makeup of CO2 and how it reacts to different wavelengths of radiation)… Wouldn’t the logical next step be to try and reduce CO2 concentrations in the atmosphere to return temperatures to around normal? I don’t see this as a liberal vs. conservative issue. As for the “arbitrarily” selected variables, I would hardly call them arbitrary. I haven’t researched any one climate model so deeply that I would know how it works, but if the variables are anything like the hundreds of specified conditions used in meteorological forecast models, I would imagine they are comprehensive. Modeling is difficult, and at this point we just aren’t sure how some variables will change as the temperature increases. However, this only brings the models’ accuracy into question 100 years from now, and does not discredit the fact that the earth is warming because of anthropogenic forcing right now. From page 11 of the IPCC report, you can see that the model output matched the actual temperature much more closely when anthropogenic variables were taken into account. This alone is pretty significant evidence that the human race is effecting the earth’s climate beyond the natural environmental variations. If you want to run a climate model on your own computer and learn more about what is involved, check out EdGCM. If you would like to read more about the issues brought up in this documentary, here is a very lengthy discussion over on RealClimate.org (529 comments on the posting at this time). Large universal topics like this deserve to be debated. Fortunately, scientists have already discussed the issue extensively over the past couple of decades. Governments, corporations, and to some extent the media don’t like what has been discovered and are deciding to take issue with it. Unfortunately, this just delays actually doing anything to help the environment and return things to the way they were. Seasonality is two years old today. Sometimes when I look back on progress made as several releases have past, it can be surprising just how much it has changed. I thought this might be a good time to revisit Seasonality’s development path and maybe talk about where Seasonality is going from here. This is a long posting, so go grab one of your favorite beverages, kick back, and enjoy the ride. Most people find it surprising that the idea for Seasonality didn’t start as an application at all, but instead as a screensaver. The screensaver wasn’t even going to focus on the weather. I wanted to design something to show weather, news, stock info, and other information. I called it gKiosk. The g came from Gaucho Software (I thought I would produce a g-line of products instead of the i-line that Apple chose), and Kiosk was the best term I could think of to describe all this information together. Since I already had some code from XRG to generate weather graphs, I started porting that first and working on the weather section. After a few weeks of working on the project, I began to realize just how involved it would be to even produce just the weather section of gKiosk. I’ve always had a casual interest in the weather. I can remember being stoked after getting a cheap plastic weather station kit when I was a kid. The instruments were useless for taking accurate measurements, but they were fun to play with. My childhood interest in meteorology didn’t develop much past that, but a general curiosity remained. With this casual interest, and some half-written code I decided to cut the news and stock portions out of the project and chose to develop a dedicated weather screensaver. Shortly thereafter, I came to another fork in the road. I wanted to develop a product that was going to sell, after all I was working on Gaucho Software full time, and without sales I was without an income. Users will buy programs they find useful, but no-one really “uses” a screensaver. Screensavers start when a user walks away from their computer, and as soon as they return, the screensaver is brushed aside so some real work can be accomplished. I didn’t want to develop a program that would be brushed aside, so at this point, I took the screensaver view I had worked on and shoehorned it into an NSWindow. Gaucho Software’s first new program was going to be a weather application, and it was going to be called Seasonality. Well, it's time to release version 0.1 of another product. 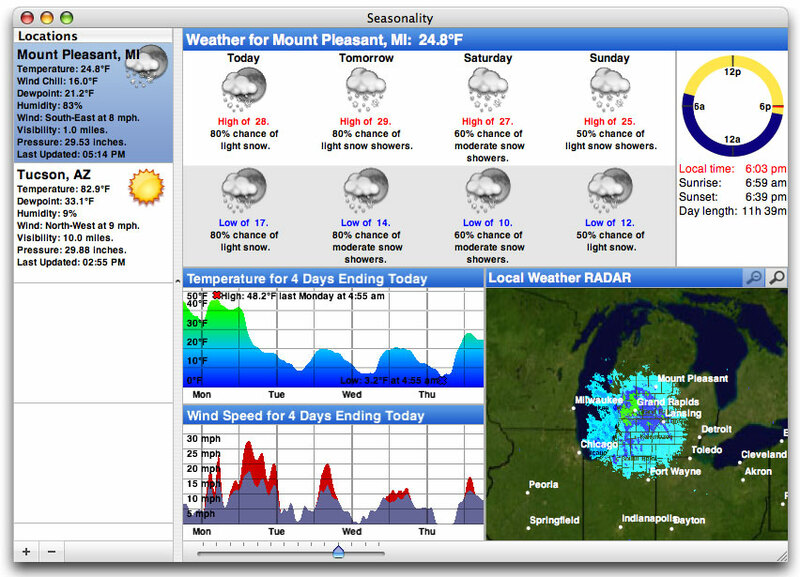 This is the first pre-release version of a new weather application called Seasonality. I've been working on this application on and off for the past 6 months, resulting in just over 10k lines of code (almost as many as XRG with over 2.5 years of off-hours development time). This is probably already assumed, but please don't pass this link along to other people. If you know of someone else who you think would be interested in testing out this app, let me know. The purpose of this release is to get some feedback from a select group of people about the design and implementation of the application itself, and I would appreciate any feedback you could give me. Questions to think about: Does the app have the basic features that you would be looking for in a weather application? Does the work-flow of the app make sense (method of adding and removing locations, changing the display, prefs, etc)? Is there anything that blatantly stands out to you as not making sense in the design? Is there anything missing (besides the obvious lack of international support)? :-) Basically, I'm looking for a sanity check before adding the final features and start beta testing for a public release. While the general layout is the same, I can’t really recognize any part of this window in the current release. Fortunately, it seemed that even though the application was very rough around the edges, the concept was good; it just needed polish, a lot of polish. One thing that I’m sure many users are thankful for though is the color theme switching from a “sunny” yellow to a blue, which looks a whole lot nicer next to other OS X applications. A lot changed in the 6 weeks after that. 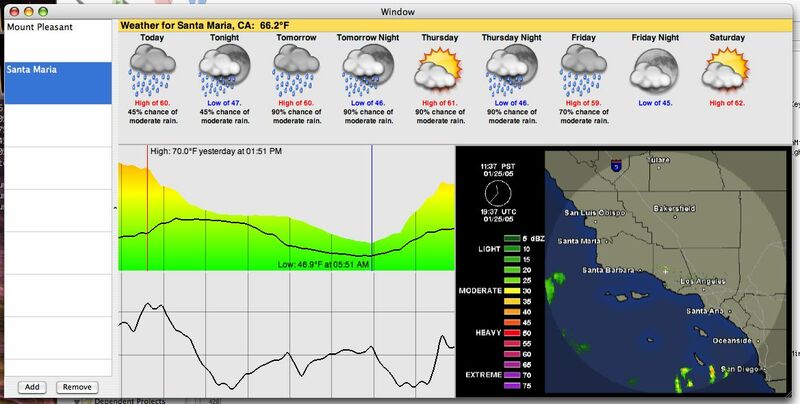 I re-worked the forecast to a more compact display with a stacked day/night view, informational text was added in the location table (along with a slicker interface for adding/removing locations), radar images turned into something that I actually generated instead of displaying an image off a website, and graphs actually became something that could be customized a bit. The 1.0 beta was pretty intense, and fortunately Katrina was putting in long hours at the office so I could do the same. Naturally, like the 1.0 release of any piece of Mac software, the support and feature requests started pouring in. It was great to hear from everyone who was giving Seasonality a try, and a lot of feature ideas I received at this time have made it into later versions (and some are still on the list of features I’m working on!). At the time there were several ideas I had for future releases, the most notable feature absence was mentioned in the email I sent out for 0.1 above: Seasonality didn’t support international locations. So I went back to cranking out code and 7 months later I emerged with Seasonality 1.1. Seasonality 1.1 had a real interactive satellite map…you could drag to navigate all over the world. The forecast changed to it’s current zigzag layout to make it easier to interpret, and the cylindrical wind direction graph was born. I still don’t think there’s any graph like it being used in other weather software, and I’m glad no one has copied the idea yet. While there have been a lot of new features added since the Seasonality 1.1 release, my programming mode kind of switched at that point. The interface had settled down a bit, and the basic featureset was looking good. I started focusing on evolving the application and molding it into what I ultimately wanted version 1.0 to be. Seasonality 1.2 contained a lot of code cleanup, a ton of bug fixes, and some interface polish. The polish and cleanup was a big change, but by far the biggest update in Seasonality 1.2 was French language support. I had wanted to support multiple languages for quite some time, but hadn’t a clue how to approach it. After going to WWDC that year and learning about OS X’s localization support, it didn’t look too difficult. Apple’s presentations at WWDC always seem to make things look easier than they are though. 🙂 I heavily underestimated the amount of work required. It took weeks, if not months, of trying to catch all of the different text phrases in the app. Not only did all the strings need a French equivalent, but spacing needed to be changed in cases where the French string was longer than the English one. Then came the help translation, which was an ordeal in and of itself with text encodings and other issues. Fortunately, Ronald and Philippe were dedicated as translators to getting everything done quickly. There were some days I couldn’t keep up with all the changes and updates they were sending over. In the end, I think users really appreciated the change, not only in France, but other French speaking countries such as Canada. Ever since, I’ve been using online translation websites fairly frequently to handle support requests. Seasonality 1.3 looked a lot like Seasonality 1.2, with the exception of the new graph handling that allowed more than 2 graphs to be shown at one time. Journalling was the next big thing here. Seasonality finally had a 2nd window! Shortly after Seasonality 1.0 was released, I received a feature request from a gardener who wanted to keep track of and take notes of the current conditions. This was my first hint that Seasonality could be used for anything other than casual weather observation. Since then I’ve received emails from pilots, sailors, home automation specialists among other fields. It’s very satisfying when someone tells me they use Seasonality in a way I haven’t thought of. Progress was going great, until August of 2006 when international support broke. Not just “broken” in the respect of being able to fix it with a couple hours of coding, but really broke. In an application dependent on web services, there’s always going to be times when an XML-RPC API will change, or maybe a web site’s layout will foul up your parser a bit. However, in this case Environment Canada pulled their international forecasts entirely. It had taken quite some time to find an international forecast source the first time around; it was even tougher to find a replacement. It took me a week or two just to find a new source, but that source was direct model output data, which is beyond any raw data I had ever worked with. This was the first time I couldn’t just display some weather data, I had to interpret what the model was predicting and programmatically generate forecasts, and then verify that the forecasts were close to what other weather providers were forecasting. It took me over a month just to write code to interpret the data and optimize the web server. From this point on I’ll be working on Seasonality 2.0. I tagged Seasonality as “weather taken to the next level.” Now it’s time to explore the level after “next.” I’m not ready to announce any new features yet, but I can say the current list is looking pretty hot (no pun intended). I’ve been mulling over a fresh interface design in my head for the past several months–an interface design that will not only improve the display of data that Seasonality currently shows, but also make room for some really cool new feature ideas I have for Seasonality 2.1+ releases… If you’re thinking of buying Seasonality today, don’t hesitate. Seasonality 2.0 is still a ways off, and everyone who purchases Seasonality now will get a free upgrade to Seasonality 2.0. If you’re still reading at this point, all I can say is “wow,” you have a lot of patience. 🙂 I’d like to send a thanks out to all the Seasonality users and beta testers… The past 2 years have been a blast and I can only hope for the same next year as well. So what does this image show exactly? Well, a whole lot of red… Seriously though, to generate this graph the NCDC took worldwide weather observations for December – February for a 30 year period from 1961 to 1990. Then, they took the combined worldwide weather observations for December – February of this year and compared the two. Temperature deviations are shown by different sized/colored dots for a given area. What’s surprising is not only the large areas over land in the Northern Hemisphere that were 5°C (9°F) or warmer than normal, but also the expanse of warm temperatures worldwide. It’s fairly common for one section of the globe to be warmer or cooler than normal for a few months at a time, but this image is showing warmer than normal temperatures almost universally around the globe. Some of this can be credited to the recent El Nino event we had this winter. El Nino does play a role, but it most certainly is not responsible for all the warming taking place. CO2 emissions are at an all-time high, and increasing at a faster rate than ever before. If we don’t do something to keep CO2 concentrations in the atmosphere in check, the earth will be a much different place to live 100 years from now.